Child Care Basics Resource Blog: The Black Bat Ball : Let’s make Bats in tuxedos for the Black Bat Ball! The Black Bat Ball : Let’s make Bats in tuxedos for the Black Bat Ball! Materials needed: Black construction paper, white construction paper, glitter, wiggly eyes, pipe cleaners, glue, and scissors. Pictures of people dancing at a Ball, with men in tuxedos. Directions: Take one piece of black construction paper and cut out a large bat. Using white construction paper make a white vest and a bow tie (two triangles will work for the vest, and two small triangles for the tie or use white tissue paper circle scrunched in the middle) and a white top hat (a small white rectangle that flairs at the bottom). Use the glitter to decorate the vest and bow tie. Glue on wiggly eyes, and tape on a pipe cleaner on the bottom of the bat. 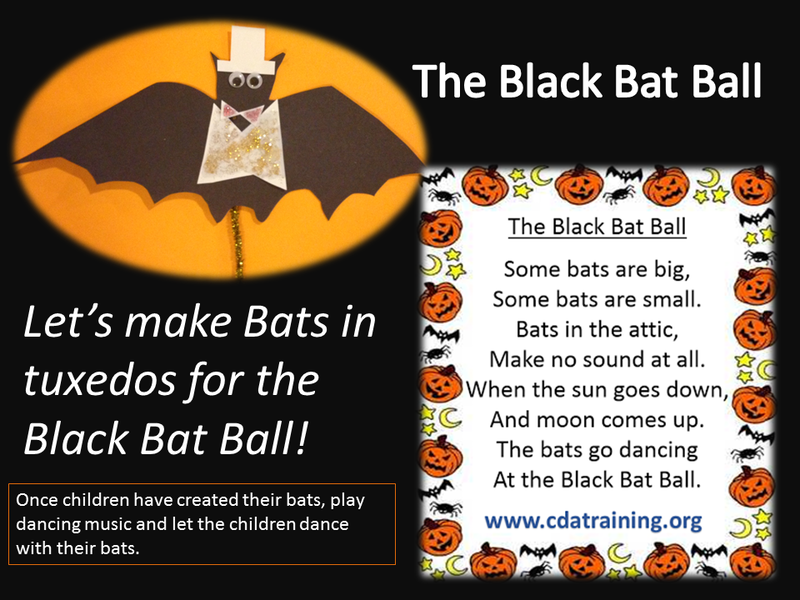 Instructions: Once children have created their bats (Let dry) play dancing music and let the children dance with their bats.